Discover Clocks' provides expert and honest clock repair services for most antique, vintage and newer model mechanical clocks. I began collecting clocks many years ago as a hobby and as a result of the many clocks I took in for repair, I eventually became friends with a master clockmaker. He taught me the trade over the next several years. I found out that I really enjoyed working on clocks and have been doing it ever since. In 2006, I moved to Florida and started buying, selling, and repairing clocks in the Crystal River, Ocala area. I look forward to repairing all of your clocks. Before I get into my repair service, let me share a service offered here for those of you who would like to ask a clock repair question. Many times, there is a very simple defect, that you can repair yourself to save your clock a trip to the shop. So, I thought a great way to save you time and money would be to have a forum where you can ask your question before taking your clock to a shop. If your questions are clearly stated with specifics about the clock type and the problem you are having,there may well be someone out there that can help. I will also answer some of these questions as time permits. I welcome any other visitor here with the knowledge to answer your question to feel free to help by commenting. View other visitor's questions, or answer them here. All clocks that come in for repair will be evaluated before repairs are made and the owner contacted for approval of work needed. As a clock collector myself, I know that the decision to repair a clock or not can only be made by the owner of the clock. Only they can know what their clock is worth to them. It is important to have a clock serviced every few years. Even though a clock will usually run for decades without it, damage is being done to the pivots, gears, and bushings every day they are run dry or dirty. 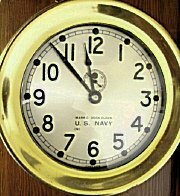 If a clock has been run this way for a long period it will most likely need a complete overhaul. Our overhauls consist of: dis-assembly and inspection of all parts, polishing of pivots, worn bushings replaced, ultrasonic cleaning, mainsprings replaced (if needed) and lubricated with mainspring grease, oiling with high quality clock oil, adjustment of escapement, re-timing, and an inspection of the case parts such as glass, hinges, hangers, etc. Then, after reassembly, the clock is tested for at least a week. If you live in Citrus County, Levy County, Hernando or West Marion County, Florida, I provide in-home service for large clocks, such as grandfathers or grandmothers, or for clocks that are difficult to move. Of course, you can also drop off your clock at our shop if you prefer. To get more information, use the repair form below. Simply leave your name and email. I will get back to you as soon as possible. We are located in Howard's Market, Building ED 11 on the south side of the market. This is 3 miles south of Homosassa Springs on Rt. 19. It's 17 miles north of Weeki Wachee. If there are no clock repair services in your area, clocks may be shipped directly to me for repair. Please contact me via the repair form below and I will get back to you as soon as possible. The form below is for clock repair questions. If you know your clock needs service, use the repair form above. Click below to see questions from other visitors to this page...If you can help them with their question, feel free to comment. Our howard miller clock chimes two minutes early every 15 minutes, how can we get it to chime correctly? The cuckoo clock is out of sequence. It cuckoos the hour time at the half hour, and once at the hour time? Any suggestions on how to fix this. Does anyone have this part -Please!! Let me know , and how much it is. Thank you so much. The chimes on my clock are not in sequence. The quarter-hour is on the half, the half is on the 45, and the 45 chimes the hour. Can anyone help? Loose spring on regulator clock. I have a battery run AED Regulator Wall Clock that won't chime on the hour. It always chimes 5 minutes early. How can I adjust this? Thanks! Woodbury Model 1360 Seth Thomas mantle clock stopped running. Gothic New Haven Clock ca. 1860-1870? The lowest note of the four chimes strikes dull/flat. Doesn't resonate. Just started doing it. Looking for a hairspring for a Seth thomas movement #103 1928. would buy a movement for parts as long as the hairspring is in good shape. Do you know where I can find the glass for this New Haven clock? Sangamo wall clock running fast. CORRECT WEIGHT FOR CLOCK WEIGHT? Gilbert Mantel Clock, How does the chime work? Seth Thomas clock runs fast. Hi - would you know where I could buy some of the figurines that are used on some of the cuckoo clocks?? Thanks. New Haven Tambour mantle clock winding question. Do you sell replacement clock keys? Or do you know the size that the Gilbert 1807 mantle clock takes? The clock runs slow, losing about 5 minutes per day. How do i adjust? Thank you. Seth Thomas Spring Brass Alarm -- How does it work? How can I syncronize the chime with the time so that it plays on the hour/1/2 hour? New Haven Clock that does not Chime correctly. Cannot keep the pendulum going. I start it swinging and the clock appears to work but pendulum stops within a minute or so. I have a Garrard three-train westminster chime mantel clock,but no pendulum. Also,what is missing at the top. I have opened it up and watched it while ticking. Everything seems clean but for no apparent reason it just stops. Hi The chime on my clock sometimes won't chime at all, or it may chime 11 times even when it is 2 or 3:00. Is there something I can try myself? Waterbury clock strikes at the wrong time. 1920's Grandfather clock strikes 15 minutes late. We have a New Haven Clock Co. Banjo Clock which chimes on 1/2 hour and hour. Is there a way to turn off or stop the chime completely? My Jerome clock has one weight that is heavier than the other. On which side, time or chime, does the heavy weight go? Hermle pendulum clock skipping notes when chiming. How do you get the hour and the number of chimes together. Mine may be on 1 and chime 6 times. It is not together..?? My mantel clock is running 15 minutes fast in a 24 hour period. How do I set the clock to run the corect time? It has a (S) and a (F) on the pendulum. We have a Ridgeway grandfather clock that won't stop chiming. How can we chimes well past the number of hours. How do we make it chime correctly? Napoleon Hat Clock - 3 hole. No instructions. Camden line C chime ?